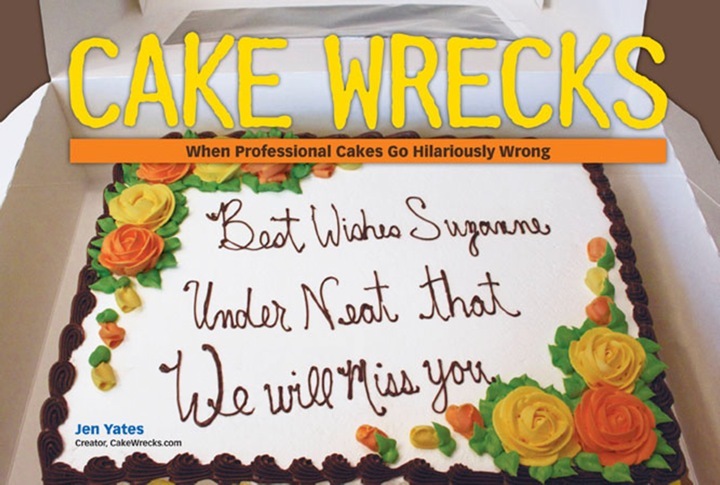 Not all Cake Wrecks are a result of poor construction, as you can see from this example. Some cake artists just seem to forget that, at the end of the day, their creation is meant to be eaten. Can you seriously imagine being told to slice up and serve this cake? But getting back to this cake - I think the worst part is that the baby is staring at me. No, really - check out the right eye. [shudder] Dang, that would be spine-tingling even if it were a real baby, you know? (And can you imagine being the person who gets served that eye? Eeeek- I'm going to give myself nightmares.) Call me finicky, but I really can't eat anything that looks like its looking at me. Still not creeped out? Then watch the video of this cake's construction. The final few seconds are the stuff horror flicks are made of ("The eye! It's opening! Aaauggh!!!). For some reason the name Rumpelstiltskin popped into my head when I saw this cake. My daughter literally jumped back from the computer screen when I told her it was a cake. That's some scary shiznit right there. it's the left eye that looks a slit open. creeeeeepy!! In all fairness to the creator, the cake wasn't meant to be served and eaten. It was for a sculpted cake contest: Cake 2006 at NEC Birmingham, UK by Michelle Wibowo. The artistry in this cake can't be denied but the "Chucky Factor" just so creeps me out. I'd feel like a baby killer cutting into this cake. Eeeuuuwww. I remember seeing the video some time ago and thinking "eck!" who the HE** is going to eat the baby! Okay, so it was made for a competition, but still, in general cake is meant to be eaten, so even a competition cake should be tasteful enough to be eaten (no pun intended). I agree with anonymous....cakes are meant to be eaten! Competition or not! but if you cut into it, is it red? are there bones? Yikes! Not sure if I'd want a piece of this cake either. I've seen similar stuff from Asia, bakery that makes products to look like human body parts. So, do you think it was a red velvet cake? I'll never be able to say "Why you just look good enough to eat!" to a baby again! Your site is great! I arrived here courtesy of a link off of joemygod.blogspot.com. I personally think almost her entire http://www.michellecakes.co.uk/portfolio.html" REL="nofollow">portfolio of work are eligible to be cakewrecks! I mean, it's great that she's apparently making a handsome living off of this stuff, but it boggles the mind who orders these things. I've seen some weird similar stuff on "King of Cakes" on the Food Channel, but nothing as creepy as this baby!! Ooh--I call the soft spot! Golly Jeepers! Totally grotty. And the WORST PART??? The cake maker is NOT wearing a HAIR NET! Well, if your a cannibal looking for a birthday cake, this would work. I'm Sure Dr. Lecter would serve it to his patients! Quit being sissies. I would love to take a knife to this cake and devour it! M-M-M! That's some gooood baby. Who the heck would eat that?!?! I'd eat it. To paraphrase Dylan Moran: "I just want to eat the face, I like to interact with my food, and if you eat the eyes first, you'll always win the staring contest." The best part is, when I watched the youtube video, I honestly thought the information said "The Making of a lifeless Baby Cake for sculpted cake competition"
Somehow, the fact that it looks like Mother Theresa as an infant disturbs more than anything else. I think it's a changeling! Can't you see? The slightly wrinkly appearance, the eerie facial expression. All says "changeling" to me. So that is where Kuato's been hiding all these years! Someone call Arnold. That's beyond wrong. As a vegan, even if it were a vegan cake, I'd probably still consider eat it wrong... cannibalism, if you will. Clearly, based on the fact that this is meant to be slices, is either to celebrate a bris, or a congrats on your abortion cake :D.
+10 experience points for sliding a knife into this train wreck! Yea, speaking of horror flicks- the first thing I thought of when I saw this cake was the remake of Dawn of the Dead!!! ZOMBIE BABY. Is it just me, or does it look like the li'l baby is resting on dishtowels? And Beth, you're right. It does look like the zombie baby from the "Dawn of the Dead" remake. Ain't nuttin' wrong with zombies. But the first zombie baby I was thinking of when I saw this Undead Pastry was the anklebiter (sorry, I couldn't resist) from Peter Jackson's magnum opus "Dead Alive." I think that someone took that phrase from Austin Powers "I'm gonna eat your baby" a little too far. Also that baby looks a lot like a dead baby. It is very creepy...indeed. Yes, I would have to say this one sort of creeped me out a bit. The baby itself is a little creepy looking...but the thought of slicing into it...what were they thinking? It looks like one of the munchkins of the lollipop guild in the Wizard of Oz....way too creepy, to eat or to just look at! This kind of thing is precisely why Charm City Cakes (Ace of Cakes fame on Food Network) stopped doing cakes of people's pets. It just got too disturbing.
" I do! I do! AHHHHHH!!! We're eating Scraps?!!? WAHHHHH!!!!!" The commentary alone on this post is well worth coming here!! The baby looks a little like a mythological dwarf of some sort to me. Or maybe I'm just a big dork like that. Also, does it look to anyone else like the "baby" is covered with whatever rags happened to be lying around? Like, "Well, our baby is ugly. Let's put a burlap sack over it and forget about it. Maybe it'll go away." Doesn't this remind anyone of the line "Open your mind Quaid" of Total Recall fame? Oh my! That is just sooo creepy.. and besides that, how do you make such a real-looking cake anyway?? and why!? It looks like an infant Yoda offered up on a platter to the Dark Lord. "Mmm, infant Jedi! Tasty!" Can you imagine putting candles in this? "Oops, set the baby on fire!" It doesn't even look like a baby, it looks like a shriveled old woman alien. Even those creepy realistic baby dolls in the newspaper inserts (which are weird to the extreme anyway) look more like an actual baby than this does. Whoever wondered if it was a red velvet cake should get a prize. Especially if it also has strawberry jam filling. just watched the video, very clever, but i agree, creepy as hell. I actually got goosebumps as it zoomed in at the end. I sure as hell wouldn't want to watch it in reverse, that WOULD be like a horror movie! I've just discovered your blog and cannot stop laughing at the insanity of some people! This is a friggin' scary cake. Sort of weird is the fact that several of the "related videos" on the YouTube page for the video of the baby cake are of women breastfeeding toddlers... educational or for perverts? I'm dying, I'm laughing so hard I absolutely cannot breath. 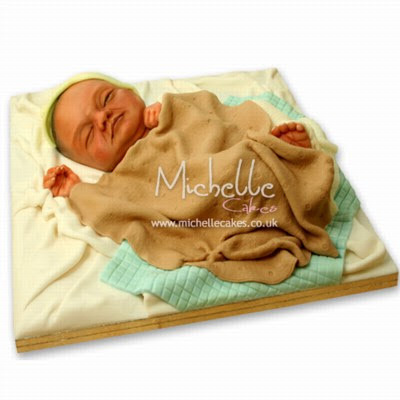 That is the scariest looking baby cake I've ever seen. I'm pretty sure it may just come alive Child's Play style, for goodness sakes it looks like Chuckie! I just found your blog and I am laughing so hard I am crying! Makes our little "Happy Birtday Andy" cake look so peanuts. But this particular baby one gives me sympathy for the 2-year old Elmo lover I know who let out horrified screams when mommy started to cut into his Elmo cake. . . . now I get it! Did they catch the serial killer that asked this to be made? That is so damn wrong. And it totally looks like an "early" baby so it's double sick that they are going to eat it.